Rabbit food selection and landing on a diet for your pet is a matter of trial and error due to the sensitive and complex nature of the digestive tract. Landing on the best rabbit diet can be a little more work than some inexperienced rabbit owners may anticipate. One area of care that some potential rabbit owners frequently underestimate is feeding. Feeding your rabbit is not difficult, but does require a greater time investment than does feeding a dog or a cat. Young rabbits will start to eat vegetables and hay at age 2 to 3 weeks. Start with the hay followed by feeding one vegetable at a time. If you notice any digestive problems such as lose stools, then stop the vegetables and start again in several days. If you notice that any age rabbit produces soft stools after introducing a new food, then either reduce the size of the food or eliminate it from the diet. If the stools are watery or diarrhea, the most likely cause is a rabbit health related problem such as parasites. The foundation of your rabbit’s diet is a continuous supply of fresh grass hay. Timothy hay is most commonly used. Alfalfa hay is commonly available in pet stores, but it is not recommended for rabbits. Alfalfa is a legume, not a grass, and is much higher in calories and protein than the rabbit requires, and too much protein in the diet can lead to medical problems. The hay should be kept in a clean, dry place that is easily accessible to the rabbit at all times. Some rabbit owners will use shallow plastic bins or unused litter pans to contain the hay. The hay bin should be emptied out every few days to make sure that uneaten hay is not accumulating and becoming stale. Hay should be used within a few months of it’s being cut before it loses its nutritional value, so if you are getting the hay from a private supplier, just be sure that it is fresh. Grass hay not only supplies your rabbit with crucial nutrients, but also allows the rabbit plenty of chewing to help keep his teeth worn down to an appropriate length. Without appropriate chewing materials, your rabbit’s teeth could become overgrown and cause serious medical problems. Wooden chew toys can be provided as supplemental chewing materials if your rabbit seems to enjoy them. In addition to grass hay, your rabbit will need 3 to 6 types of fresh vegetables on a daily basis. Leafy greens, such as kale, romaine lettuce, collard greens, or turnip greens provide important nutrients and your rabbit will love them. Leafy greens should be provided in fair amounts every day. Non-leafy vegetables, such as carrots, celery, broccoli, and cabbage can also be given every day in smaller amounts. If providing lettuce, opt for dark greed and red. Avoid light green or iceberg lettuce and cucumbers as these can cause diarrhea in some rabbits. Also do not feed too much cabbage since it can cause enlarged thyroid glands as well as digestion issues. 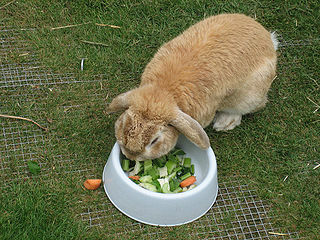 The water contained in vegetables also helps with the rabbits gastrointestinal system. As a general guide, a 6 lb rabbit diet should consists of 1.5 to 2.5 cups of fresh vegetables/day. If the amount changes the consistency of the stool, then pull back to a smaller quantity. It may take some experimentation. Start by feeding just one type of vegetable in small pieces without over feeding the rabbit. After a week, introduce another and then another. If you notice any change in the feces such as soft stools or diarrhea, then either pull back to smaller pieces or eliminate the newly added food. Fresh fruits, such as strawberries, apples, and banana can be provided as a snack. Fruits are much higher in sugar than vegetables, so it is important to give them only in very small amounts – no more than a couple of teaspoons for a medium-sized rabbit. They are a good source of vitamins and minerals. Most rabbits can digest fruit, although in a minority of pet rabbits it may cause gas and watery stools. Rabbit Food Tip: Pineapple and Papaya contain enzymes that help break down fur that is binded together with food. These fruits could be helpful during molting season where a rabbit might ingest more fur. The third component of your rabbit’s diet is pelleted food. 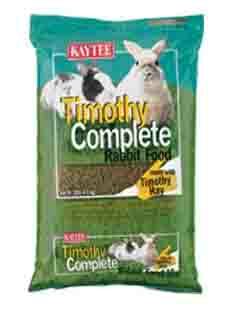 Most rabbit owners provide a pelleted rabbit food on a daily basis. Pelleted rabbit food is available at most pet supply stores, and provides your rabbit with nutrients that he may be missing or getting in inadequate amounts from his hay and fresh food. Immature rabbits can be fed as much pelleted food as they will eat, but once the rabbit is fully grown the amount should be reduced to no more than ¼ cup per 5 pounds of body weight. One last part of your rabbit’s diet should be a continuous supply of fresh, clean water. The water should be kept in an upright dispensing bottle or a sturdy dish, and should be changed every other day to prevent growth of bacteria or other pathogens.